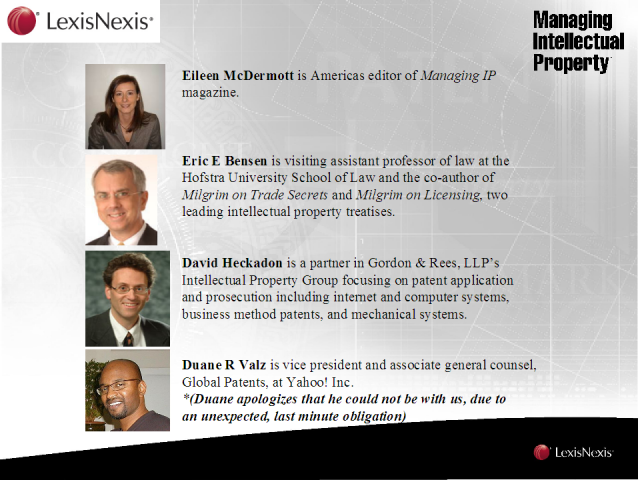 Managing IP, in association with Lexis Nexis, will host a web seminar on April 2 at 11 am EST, 8 am PST, examining the questions posed by the October 2008 US Federal Circuit decision in In re Bilski. The webcast participants will include Duane R Valz of Yahoo!, Eric E Bensen of Hofstra University School of Law and David Heckadon of Gordon & Rees. The panellists will dissect what the new test means for the software industry, via in-depth analysis of some of the first USPTO Board of Patent Appeals and Interferences decisions to apply Bilski. They will also provide their assessments of the state of software patentability 6 months after the decision and consider alternative methods of protecting software.